Anxiety disorders affect more than 40 million Americans each year, and is twice as common in woman as in men. Anxiety is a psychological disorder that is characterized by an overwhelming and persistent feeling of worry, tension, and nervousness, even when there is seemingly nothing to provoke these feelings. There are several causes of anxiety, including hormone fluctuations and excessive stress. Although there are several types of anxiety, this article focuses on social anxiety disorder. It is natural to feel nervous in certain situations, such as for interviews and when public speaking.Social anxiety disorder (also called social phobia), however, is a chronic health condition that is characterized by the overwhelming and often illogical fear of being embarrassed in everyday social situations. For people with social anxiety disorder, everyday interactions can cause irrational anxiety, fear, self-consciousness, and embarrassment. Events that may cause increased levels of social anxiety disorder include using public bathrooms, eating in front of others, initiating conversations, dating, attending parties or social events, or drawing attention to yourself in public. Social anxiety disorder symptoms can be divided into emotional, behavioral, and physical. Emotional and behavioral symptoms can include intense fear of interacting with strangers, worry about embarrassing yourself, difficulty making eye contact, trouble speaking, and avoiding being the center of attention. Physical symptoms of social anxiety disorder can include blushing, sweating, shaking, nausea, muscle tension, and racing heartbeat. Social anxiety disorder is most likely caused by a combination of genetics and environmental factors. These can include family history, chemical imbalances in the brain, and traumatic life experiences. Those who experienced bullying, ridicule, rejection, and teasing during childhood are more vulnerable to developing social anxiety disorder. 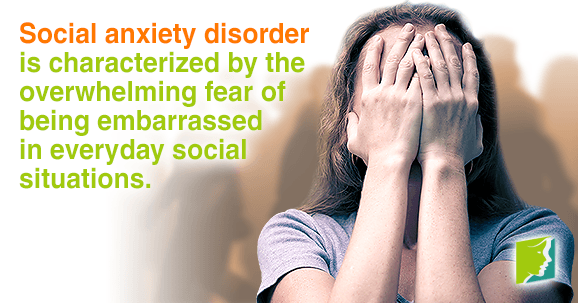 There are several treatment options for social anxiety disorder. The two most common treatments are psychotherapy counseling and prescription medication, or a combination of the two. This can help with anxiety disorders because it can help a person with social anxiety change negative thoughts that they have and develop skills to help them in certain social situations. They can help lessen social anxiety disorder by acting on serotonin in the brain or by blocking the stimulating effects of adrenaline. Additional natural treatments that have been shown to help with various anxiety disorders are exercising regularly and eating healthy. Exercising releases “feel-good” neurotransmitters in the brain. Try to avoid excessive amounts of caffeine, which amplifies anxiety symptoms. Social anxiety disorder is a chronic health condition that is characterized by the overwhelming fear of being embarrassed or nervous in everyday social situations. Genetics and environmental factors, such as previous emotional trauma, can trigger social anxiety disorder. However, if social anxiety disorder is lowering a person's quality of life it can be treated with a combination of lifestyle adjustments, counseling, and medications.